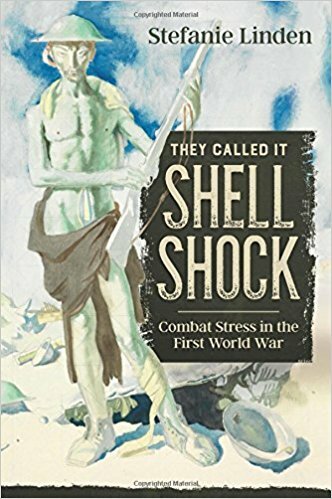 Dr Linden’s “They called it shell shock” deals with a complex subject: one that is often now conflated with combat and post-trauma stress concepts such as PTSD. Drawing upon the records of the leading hospitals that dealt with shell shock cases, and in particular the 600-plus individual case notes at the National Hospital at Queen’s Square in London, she has produced a readable and fascinating account. They called it Shell Shock provides a new perspective on the psychological reactions to the traumatic experiences of combat. In the Great War, soldiers were incapacitated by traumatic disorders at an epidemic scale that surpassed anything known from previous armed conflicts. Drawing upon individual histories from British and German servicemen, this book illustrates the universal suffering of soldiers involved in this conflict and its often devastating consequences for their mental health. Dr Stefanie Linden explains how shell shock challenged the fabric of pre-war society, including its beliefs about gender (superiority of the male character), class (superiority of the officer class) and scientific progress. She argues that the shell shock epidemic had enduring consequences for the understanding of the human mind and the power that it can exert over the body. The author has analysed over 660 original medical case records from shell-shocked soldiers who were treated at the world-leading neurological/psychiatric institutions of the time: the National Hospital at Queen Square in London, the Charité Psychiatric Department in Berlin and the Jena Military Hospital at Jena/Germany. This is thus the first shell shock book to be based on original case records from both sides of the battle. It includes a rich collection of hitherto unpublished first-hand accounts of life in the trenches and soldiers’ traumas. The focal point of the book is the soldier’s experience on the battlefield that triggers his nervous breakdown – and the author links this up with the soldiers’ biographies and provides a perspective on their pre-war civilian life and experience of the war. She then describes the fate of individual soldiers; their psychological and neurological symptoms; their journey through the system of military hospitals and specialist units at home; and the initially ambivalent response of the medical system. She analyses the external factors that influenced clinical presentations of traumatised soldiers and shows how cultural and political factors can shape mental illness and the reactions of doctors and society. The author argues that the challenge posed by tens of thousands of shell-shocked soldiers and the necessity to maintain the fighting strength of the army eventually led to a modernisation of medicine – even resulting in the first formal treatment studies in the history of medicine. “They called it Shell Shock” is also one of the first books to tackle often neglected topics of war history, including desertion, suicide and soldiers’ mental illness. Based on her expertise in psychiatry and history of medicine, the author argues that many modern trauma therapies had their root in the medicine of the First World War and that the experience of the shell shock patients and their doctors is still very relevant for the understanding of present-day traumatic diseases.